If God were to create a man in the image of a Saturday morning cartoon, it's highly likely that he would look like Brendan Fraser: a hulking, manically expressive dervish with a megawatt grin. 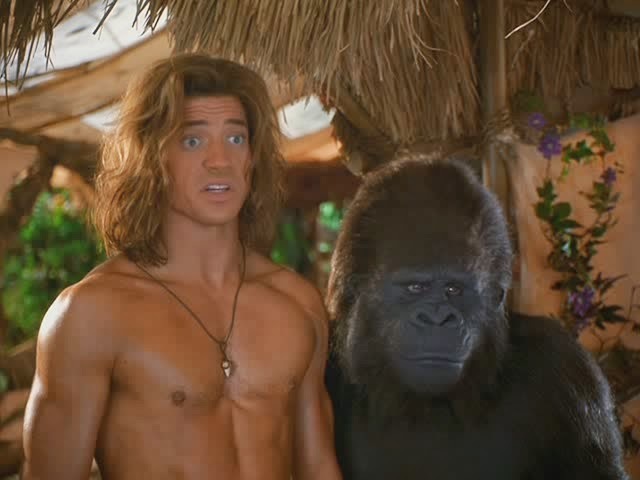 There are many ways a live-action remake of Jay Ward's George of the Jungle could fail; the only way it works, however, is with someone as committed and sincere as Fraser at the center of it all. George of the Jungle pulls out all the stops in an effort to elicit laughs, rapidly transitioning from broad slapstick to broad fish-out-of-water comedy to broad meta-jokes (courtesy of the wry narrator that was a hallmark of all Ward's cartoons). And keeping everything afloat is Fraser, whose own performance is a stunt on par with the various tricks, both animal and human, that fill in the gaps between each of the movie's shameless yet lovingly rendered gags. Correction: In this episode we refer to Jungle 2 Jungle's release date being in July 1997. It was actually released in theaters in March 1997. Turns out we were the only ones obsessed with "Jungle Month" tie-ins.